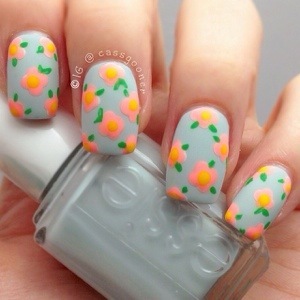 Choose any 3 nail polishes for FREE, just pay a total Shipping & Handling of $12 OnLY! Offer valid NOW – 7/6/14 (11:59pm EST). It’s that time of the year again, Zoya has announced that they will be disposing off our unwanted polishes in exchange for half off any new Zoya polish!!! Give the earth a helping hand by joining the healthy nail polish movement! Since its inception, ZOYA has been the pioneer of toxin-free nail polish, releasing the most beautiful colors in the healthiest formula available each season. With Zoya Nail Polish, you don’t have to compromise a healthier lifestyle for a glamorous one. go worry-free with a formula that is free of nasty chemicals like Formaldehyde, Formaldehyde Resin, Dibutyl Phthalate, Toluene and Camphor. Now you can join smart, eco-chic women who are changing their world, one gorgeous Zoya Nail Polish bottle at a time! To help kick start your “color cleanse”, the Zoya Earth Day Nail Polish Exchange is BACK for 2014. Not only is ZOYA making it easy to swap out old, unwanted color for the world’s healthiest and longest wearing natural nail polish formula on the market, we will dispose of your old shades in an eco-friendly manner! This offer is only good for 1 week so hurry – Don’t Wait! What is the Zoya Nail Polish Exchange? Exchange your old nail color for BIG5FREE** ZOYA Nail Polish and let us properly dispose of your unwanted bottles. Only $4.50 per bottle OR $5 for PixieDustT and special effect toppers. Shipping and handling fees apply. Don’t forget to share your NEW colors on Facebook, Twitter and Instagram with Zoya (@ZoyaNailPolish) using #ZoyaEarthDay! Visit http://www.zoya.com and add at least 6 bottles and no more than 24 bottles of polish to your cart (salon accounts minimum 12 maximum 48 bottles). 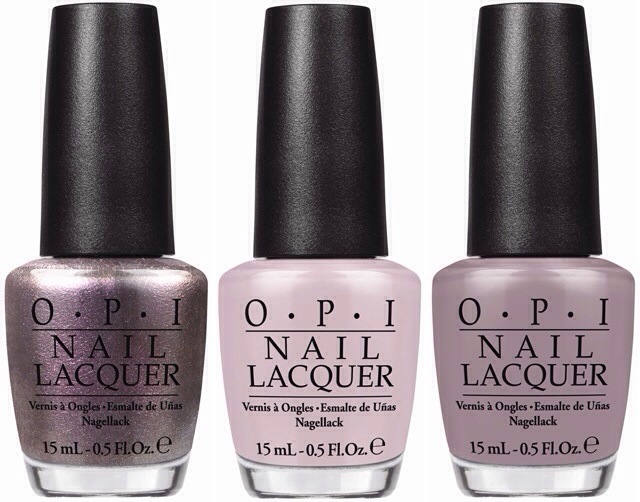 Excludes ALL Summer 2014 Collection shades (Tickled, Bubbly & Summer Magical PixieDust). I was trying to figure out the upcoming nail trends for 2014.. What’s hot what’s not .. So I thought it might be nice to share the ones that strike my fancy .. These are a compilation from different sources (links added to the parent site) … Let me know what you like and what you didn’t .. So please sit back and enjoy the ride !! 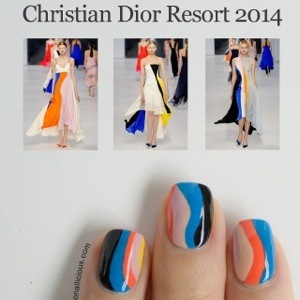 Christian Dior Resort 2014 Collection Inspired Nail art. Click here for steps to recreate the look. 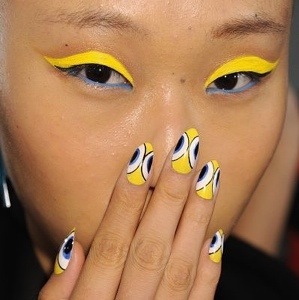 Click here for a video tutorial on how to recreate the Ruffian’s Runway Ready Retro Moon manicure. Btw: For those like me who were not sure of the difference in half moon and Ruffian mani, I found this really helpful post , do give it a look click here. 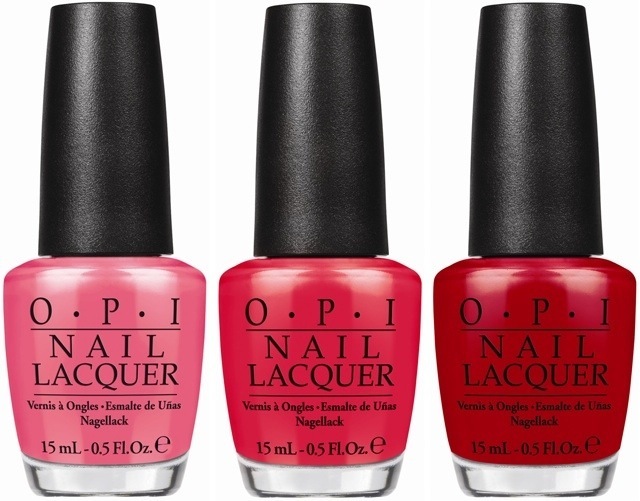 The new Opi collection Brazil will be on sale beginning February 5,2014 including Both nail lacquer ($10.95 each) and gel formulas. 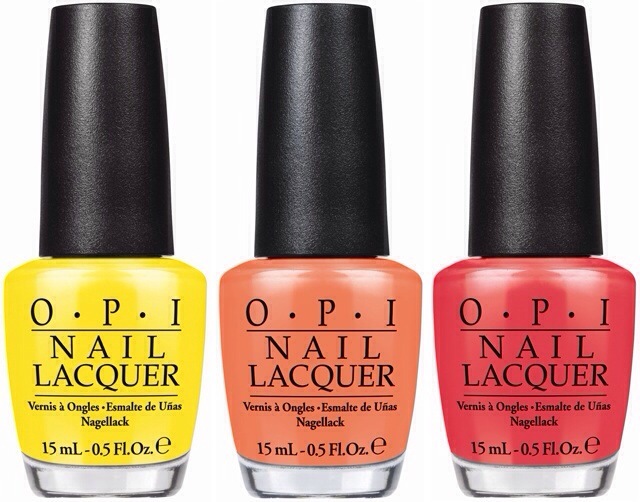 The 12 Vibrant colors will be carnival on your finger tips ! For texture polish lovers, Beach Sandies Liquid Sand 4 piece mini pack will be something to look forward to! 8) Where Did Suzi’s Man-go? OVeRALL: I won’t call colors absolutely unique, but they are all super exciting, vibrant and make me want to own each one !! Absolutely looking forward to it !!! 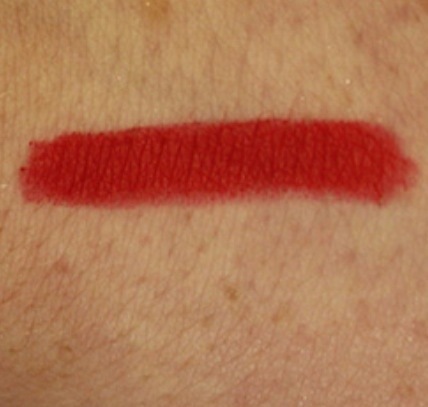 Maneater – classic cherry red, matt finish ( sold at Sephora. Click for swatch. Picture makes it look like a deep dark red, highly pigmented with deep shimmer. 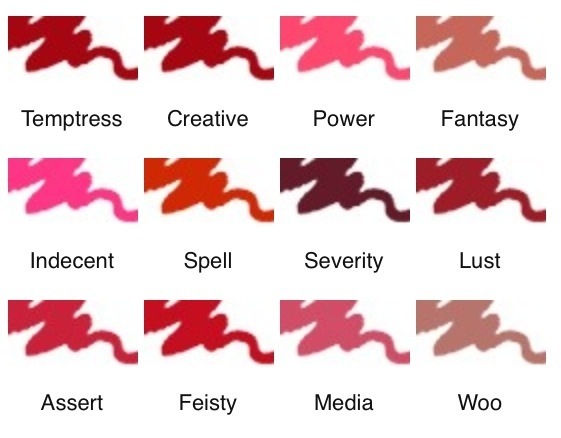 Feisty ( Scarlet Red) … True to its name, this color is Fiesty ! and I am absolutely loving it ! I couldn’t find it in few American stores, so I am not sure of its availability .. (image from the Illamasqua website. 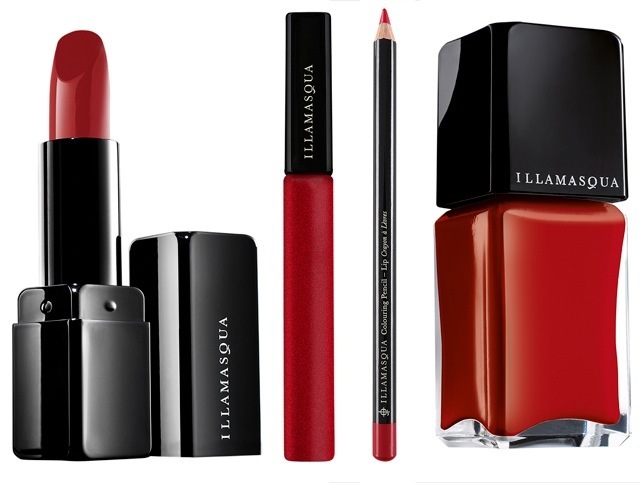 I have not used any products by Illamasqua, but RED’s .. YES PLEASE ! I even found all the swatches here. January 2014 marks the launch of 14 new shades. 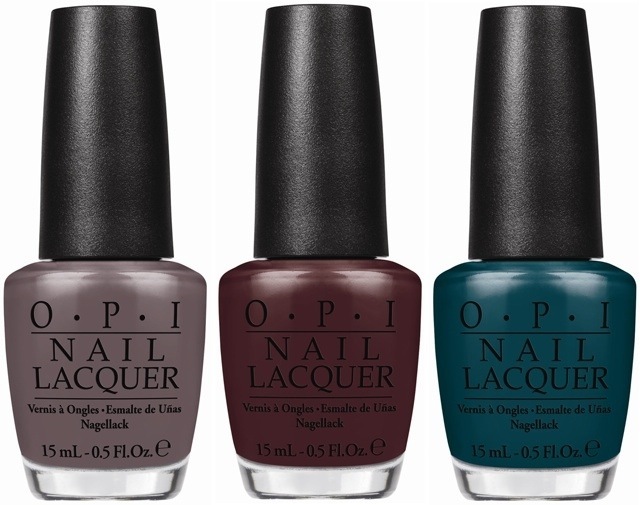 Nicole by Opi, in collebaration with Carrie Underwood, will introduce a mix of pastels, vampy dark shades to glitters. January 2014, they should be available in mass retail stores !